Manufacturer of conveyor belt cleaning technologies, Martin Engineering (Martin), has introduced a factory-direct programme to deliver and install new replacement polyurethane blades that are accurately specified, custom fitted and mounted free of charge. The company’s Mr. BladeTM UK programme will allow Martin to maintain an electronic record of operating conditions on all conveyors using its equipment. This data will be updated regularly, providing customer management with an operational assessment of vital components, including recommendations for avoiding costly failures and system downtime. Furthermore, certified Martin service technicians will adjust, repair or replace the main frame and tensioner of any belt cleaner at no charge, for as long as a customer maintains a Mr. Blade service relationship. 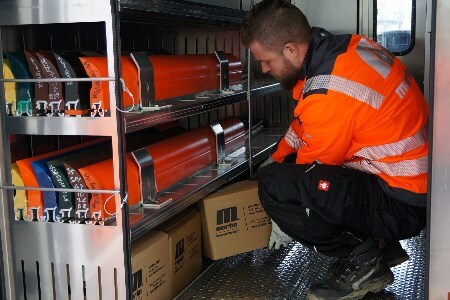 The vans have been designed as mobile business units, with technicians who are able to electronically enter and update data on each customer system right at the site. With a lifetime record of all belt cleaning equipment, customers will have access to details on the mounting assembly, tensioner and blade wear life, along with total annual cost information for budgeting purposes. Each vehicle will be equipped with the business tools and software to provide quotations on the spot, and all will have credit card transaction capabilities to deliver a convenient customer experience.